This course will provide instruction to prepare students to meet the challenges of todayâ€™s Administrative Assistant who is expected to perform at a high business and professional level in a business office environment. 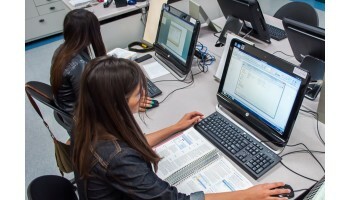 Students will gain knowledge of utilizing the Microsoft Office Suite (Word, Excel, PowerPoint, and Access) This instructional program will include advanced training in business communications through real-life business projects designed to provide knowledge of integrating the use of technological software to meet office management demands in areas of office operations, report preparation for various departments, office record keeping and management systems reports. Other areas of instruction will include proper e-mail etiquette, teleconferencing, travel planning, preparation of meeting agendas, basic budgeting and financial analysis, and developing presentations for business purpose. Externship opportunities will be included in this instructional program. Oscar N. has successfully found employment as a Plumber's Helper after completing course(s) in Plumbing. Jamie C. has successfully found employment as a Dental Assistant after completing course(s) in Dental Assisting.